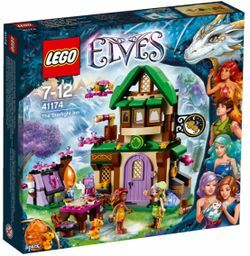 41174 The Starlight Inn is an Elves set released in 2016. 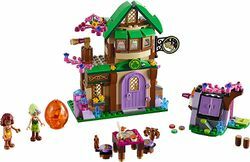 Travel with Azari Firedancer the fire elf, and Spark the baby fire dragon, to the Starlight Inn! Meet Sira Copperbranch the Sky Captain, who takes care of the Inn, and take a tour inside. Set up Spark’s egg in the cellar before you have some tea and learn more about the Inn and the Sky Captain. Tuck Spark in his egg then sleep well so you’re ready for more adventures in Elvendale! Visit the Starlight Inn in Elvendale for a cozy night’s rest during your adventures. Get a good night’s sleep before the next big adventure. The Starlight Inn measures over 5” (15cm) high, 9” (23cm) wide and 3” (9cm) deep. Facts about "41174 The Starlight Inn"
This page was last edited on 21 January 2018, at 19:28.